“The Party” (2017 production, 2018 release). Cast: Patricia Clarkson, Bruno Ganz, Cherry Jones, Emily Mortimer, Cillian Murphy, Kristin Scott Thomas, Timothy Spall. Director: Sally Potter. Screenplay: Sally Potter. Web site. Trailer. 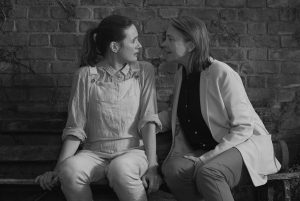 When Janet (Kristin Scott Thomas), a newly appointed British Minister of Health, hosts a small celebratory reception for a select group of friends in her London home, she approaches the soiree with the best of intentions. She attends to every detail, including making the food herself. But handling all the arrangements on her own is unavoidable, given that Janet’s woozy, withdrawn husband, Bill (Timothy Spall), a university professor, is preoccupied with obliviously imbibing on wine and spinning an eclectic selection of classic rock songs on the living room turntable. Such is the setup when guests begin to arrive, including April (Patricia Clarkson), Janet’s outspoken cynical best friend from across the Pond, and her relentlessly upbeat boyfriend, Gottfried (Bruno Ganz), a life coach steeped in seemingly every New Age discipline conceivable; Martha (Cherry Jones), a women’s studies professor and colleague of Bill’s, with her young partner, Jinny (Emily Mortimer), in tow; and Tom (Cillian Murphy), a manic, uptight, cocaine-snorting high-finance professional who obviously has some sort of issue on his mind, given that he brings a concealed holster and pistol to the party. With all but one guest (Janet’s overworked aide and Tom’s tardy girlfriend, Marianne) present, April proposes a toast to Janet’s good fortune. But Janet’s success is only one of several pieces of news revealed as the festivities begin. At the risk of stealing the host’s thunder, Martha announces that Jinny is pregnant and that the couple is expecting the arrival of triplets. And, if all that weren’t enough, Bill manages to sober up enough for an announcement of his own – the revelation that he’s terminally ill, news that helps to explain his uncharacteristic behavior – and that puts quite a damper on the evening. Needless to say, Bill’s announcement shocks everyone, but it’s just the tip of the proverbial iceberg. In short order, he makes additional unexpected declarations, setting in motion a chain reaction of revelations – some intended, some not – among all of the guests that take the event in directions no one, least of all Janet, ever saw coming. Some of the pronouncements involve the disclosure of individual secrets, while others expose previously unknown involvements among the guests – connections that no one ever knew anything about. As more and more secrets are revealed, relations among the guests become strained as the event’s prevailing tone grows increasingly tense. With nerves frayed, raw emotions emerge, prompting this band of haughty intellectuals to quickly chuck their logic and rationale in favor of more base feelings. As everyone attempts to sort out his or her reactions, Gottfried tries to intervene, serving as a sort of impromptu sounding board or father confessor. But even his attempts at being a calming force are no match for the shrill, uncensored sentiments swirling about. And, as the stakes get raised, viewers need to bear in mind that a gun is still present on the premises. So how do things get so out of hand? Listen to what the characters have to say about themselves and how they conduct their lives. The seemingly reasonable, sufficiently restrained statements they make amidst the torrents of emotional tirades that come rushing forth are indeed quite telling, revealing them to be far different people from the eminently civil, supremely erudite sophisticates they claim to be. Keeping up such façades takes considerable effort on their part, not unlike the strain placed on a seawall holding back an ocean that’s just waiting for one small crack to emerge and spring a leak. In this case, though, there has been so much held back for so long that it’s unclear whether the flood can be contained once unleashed. 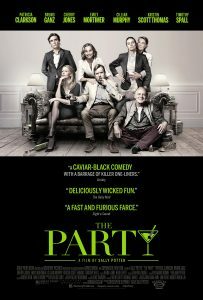 “The Party” thus illustrates what it means to be our authentic selves – and what can happen when we’re not. The painful but truthful revelations that come rushing forth mirror who these people really are. Their exposed natures thus become reflections of their inner selves, most notably the beliefs that make up their character and that subsequently typify the reality they create for themselves. These are the end products of the conscious creation process, the philosophy that maintains the existence we experience manifests from these underlying building blocks. And they do so in complete fidelity with their source, for better or worse, warts and all. If the party guests are upset with what they see in themselves and one another, they must look to themselves first, for they’re the ones responsible for how things materialize as they do. They’re not permanently saddled with such circumstances, but they nearly always must be recognized for what they are – and how they arose – before they can be changed to something more palatable. Where these individuals are concerned, invoking such change will likely require a great deal of work, from being honest with themselves to being honest with one another to making amends for any harm they may have caused. In some cases, it may even be more than they’re capable of handling, but at least the revelations that emerge at the party provide a starting point – if they even want one in the first place. Having someone on board for the guests to come clean about their true nature is where the importance of Gottfried’s presence comes into play. Though he takes a great deal of ribbing about his demeanor and sensibilities from other guests (especially his own significant other), he ultimately plays a pivotal role in helping to sort out the complexities of the unfolding drama. He gives the others an opportunity to open up about themselves, to help them come to terms with the true nature of their beliefs and beings, to give them a chance to make appropriate changes – that is, if they’re willing to do so, something that’s far from guaranteed. In any event, the party provides the guests with a place to potentially begin changing their beliefs and, by extension, their lives and realities. Will they do so? That’s what remains to be seen as the festivities unfold. 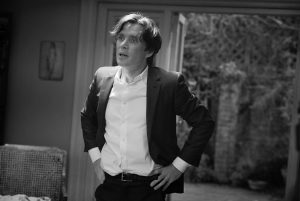 Despite some occasional pacing issues and a few instances where cynical satire spills over into outright nastiness, this wry, witty account of a celebration gone terribly wrong features an excellent script, a marvelous ensemble cast and stunning, poignant black-and-white cinematography. There’s plenty to chew on with this offering, from the incisively written dialogue to the razor sharp insights to the big laughs that result from many of its spot-on one-liners. While this project would probably work better as a stage play, it nevertheless generally delivers the goods in its on-screen format and does so with a positively wicked sense of humor.